I’ve been filling in the gaps today, with rows of spring onions, beetroot, radish and various salad greens appearing all over the raised beds. So that we have at least something green by the weekend I’ve also planted out the New Zealand spinach that was originally meant to be part of the container growing demonstration. I It was slightly disappointing in the container but having just read how to plant it whilst searching for the link, I’m amazed I managed to get anything at all. I also have a few things off the market (mainly lettuce). It’s good to fill in the gaps, but I have a confession to make. I’m not that fond of salad. Spinach is OK but lettuce is tasteless, radish is pointless and beetroot is downright unpleasant. Thoughts like these are a disadvantage when it comes to growing your own. Fortunately I love beans, peas, courgettes, nasturtiums and horseradish, which are the other things I’ve been planting. My Good King Henry, comfrey, bamboo and pampas grass are all refusing to show but the rhubarb seedlings are looking good and I’ve just been re-potting Cape Gooseberry seedlings. I’m now starting to worry (after finding out about what I should have done with the NZ spinach) that there’s a lot more I need to learn and that I need to fill gaps in my knowledge as well as the physical gaps in the beds. 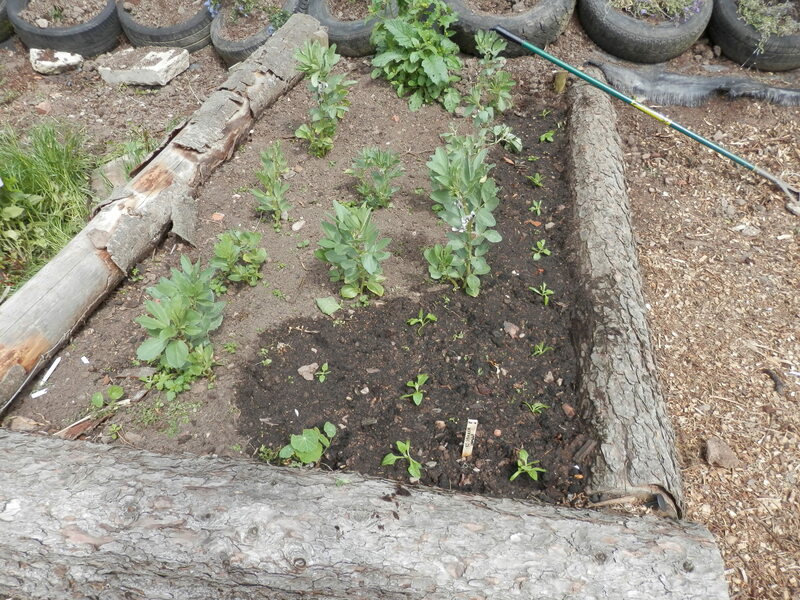 This entry was posted in Gardening and tagged beans, Good King Henry, raised beds, salad greens on May 31, 2015 by quercuscommunity. I know farmers need rain (or so they always tell us until they start telling us the rain will ruin them), but I really could have done without the rain today. We’re on clay (you may have heard me mention it a time or two) so it meant I couldn’t get on the newly cleared beds. We could still get into the herbs and Julia has been potting some of the bigger ones for the plant stall on the 7th June. I’ve been on the raised beds near the kitchen and made a couple of runner bean wigwams. One will have the roots we’ve overwintered for the last two years, and the other will have some new ones from this year. 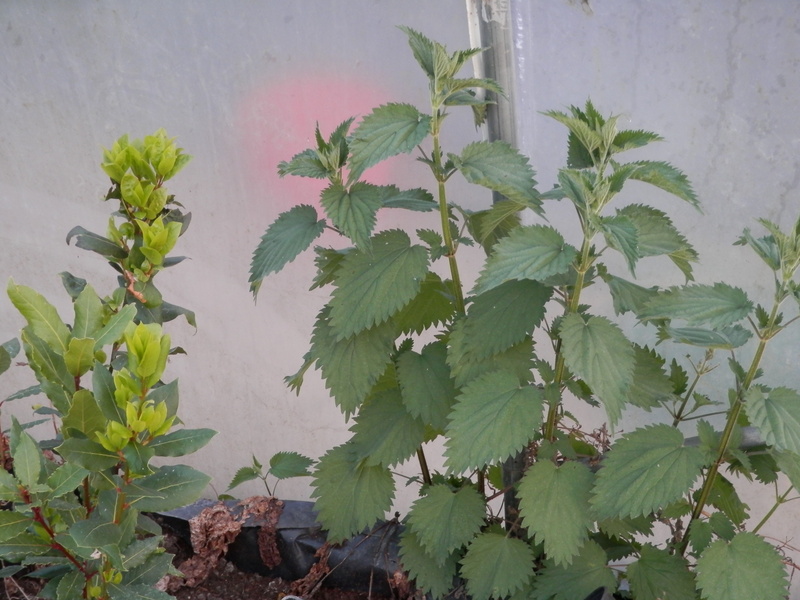 Looking at the luxuriant growth of the old ones (already in flower despite being kept in a bucket in the polytunnel till now) and comparing it with the stringy new growth it doesn’t look much of a contest. We will have to see – when you talk to people about it the majority seem to think you are better using new plants every year. I will keep scrupulous records of cropping dates, numbers and weights and see what it tells us. It will probably tell you that after the first week the reporting system fails. When you add my lack of paperwork skills to the effect of random harvesting by passers-by it’s almost a certainty! This entry was posted in Gardening and tagged biscuits, National Biscuit Day, rain, runner beans, wigwams on May 29, 2015 by quercuscommunity. Had a day off today – should have known better. Sorry to everyone on Twitter – you may have read that already. Arrived around 5pm to find that the polytunnels hadn’t been opened all day. Most things were actually OK, though my rhubarb plants, now around 2-3 inches high, hadn’t liked the heat. 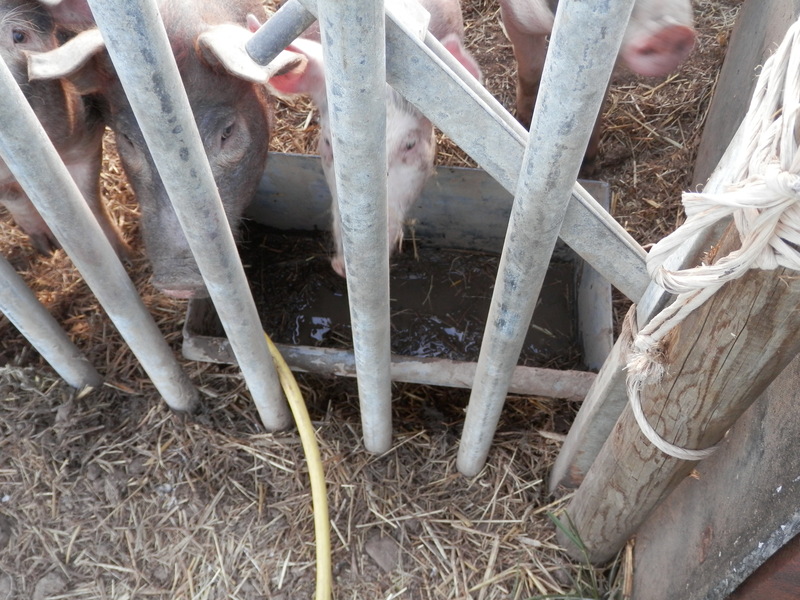 After that I found myself in demand for a number of jobs and when I finally finished watering (the job I came in to do) I noticed the pigs weren’t happy. They had knocked the trough over again to make themselves a wallow. Then they decided that they wanted a drink. They are considered to be an intelligent animal, as well as a source of the world’s most perfect food – bacon sandwiches. There is a lot more to say about intelligent animals and bacon sandwiches – please don’t think I’m treating the subject lightly, I’m just pushed for time. Also managed to get two new beds rotavated. It cost me a few quid but I just ran out of time to do it myself. And I’m lazy. Plus I’ve learned it’s better to pay someone and get the job done rather than look at a plot full of weeds and good intentions. 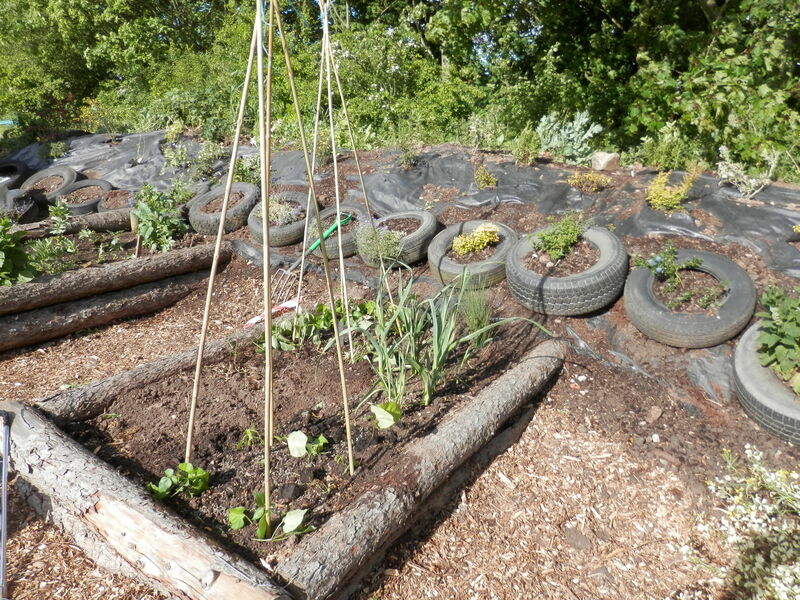 This entry was posted in Gardening and tagged animal intelligence, new beds, pigs, polytunnels, rhubarb on May 28, 2015 by quercuscommunity. 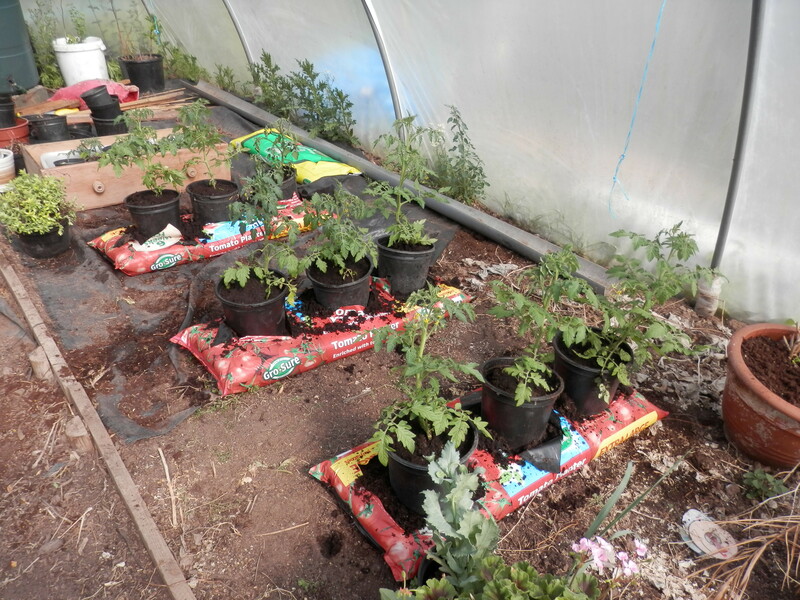 A tidy polytunnel – is it a good thing? There are some who would say no, because, like a tidy kitchen it’s a sign that not much is happening. Maybe a bad analogy as a dirty kitchen can kill. Having said that, it hasn’t got me yet. This is what we ended up with after a weekend of labour interspersed with visitors and scarecrows. When all is going wrong, like the newly flattened leeks or the Mystery of the Trampled Rhubarb, it’s nice to reflect we did one thing that looks good this week. 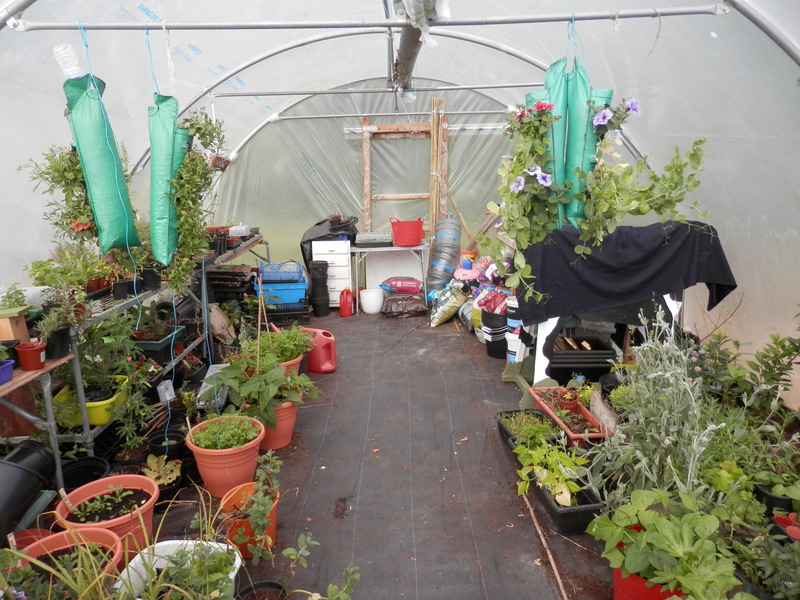 This entry was posted in Gardening and tagged polytunnel, tidiness on May 27, 2015 by quercuscommunity. It’s not long after my last post but I need to catch a day up. Today was an old-fashioned kitchen day with the smell of gingerbread, the sound of happy kids and the clatter of gravel. There seems to be some sort of unwritten rule that kids under the age of 8 have to fill their friends’ pockets or shoes with small stones. It makes for quite a lot of sweeping up but acts as a cover for me as I throw handfuls into the raised beds to improve drainage. Then it was scarecrows. 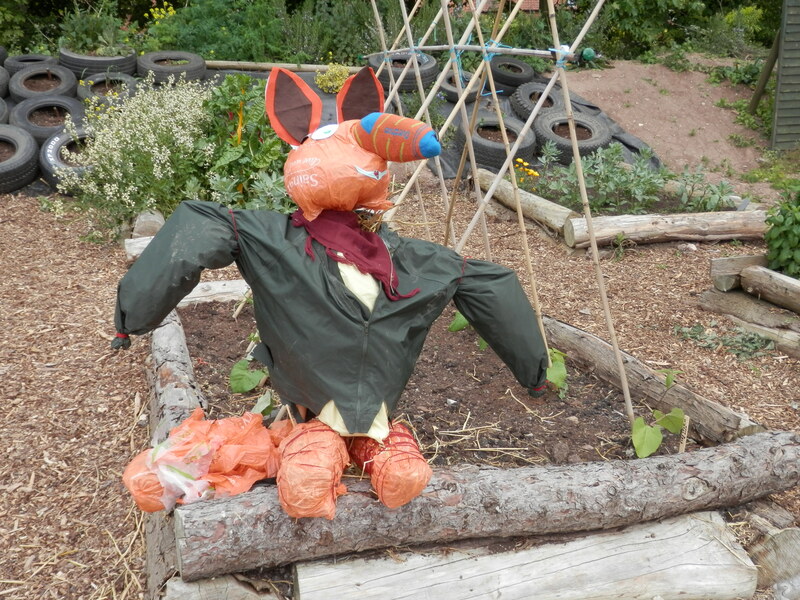 Did I mention we are having a scarecrow competition on Open Farm Sunday – 7th June? More importantly, did I mention you can enter a photograph by email? Yes, it’s a fox guarding my new bean trial. Don’t ask. 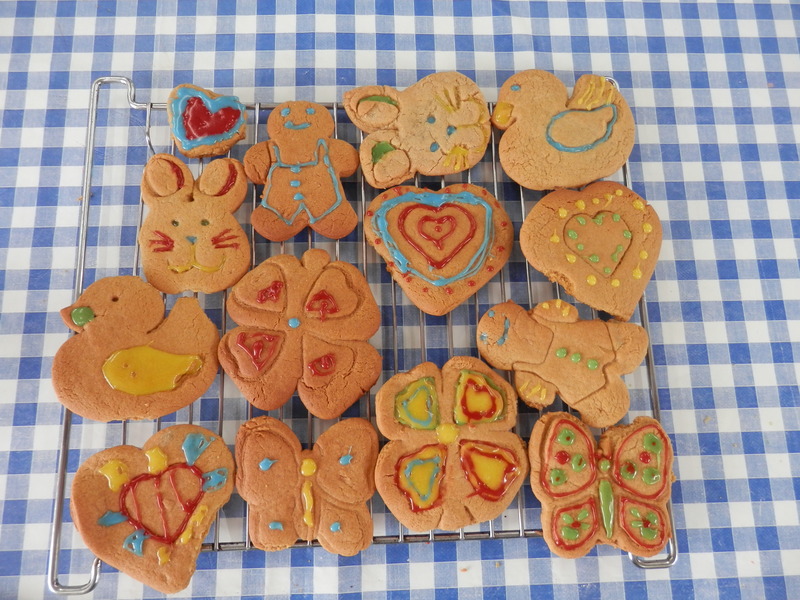 This entry was posted in Baking and tagged biscuits, fox, gingerbread, scarecrows on May 26, 2015 by quercuscommunity. We had a strange day at the farm yesterday. With nobody in we managed to force our firstborn into action and shifted quite a lot of work. This was despite frequent visits from a variety of people. I wasn’t allowed to talk to them because I’m considered a trifle direct when people stop me working, so I was able to brew mint tea, make the nettle soup for today, restructure the herb bed and plant the new beans after the problematic start to the “Bean Trial”. More of that later. Sorry if the tenses seem a little strange in that paragraph, it was originally written yesterday but will be posted today, which was tomorrow when I wrote. Julia spent half the day explaining what we were doing, what the statues were, what was happening on Open Farm Sunday and how to enter the Scarecrow Competition. She’s very good with people. I’m good with tools of destruction, a talent which came to the fore when we got home. The laburnum tree, which had been leaning at an increasing angle over the last few months (coinciding with the time erection of next door’s new fence, though I am pointing no fingers here) had finally given up its struggle with gravity. They don’t look like much but I can assure you there’s a lot of wood in a laburnum, particularly when you’re using a pair of loppers and a pruning saw. The worst is over now ad I’ll be able to get on with pruning the plum, which is why I’d originally gone into the back garden. I’ll miss it because laburnums have featured in my life since I was about 6 and we moved to a house with one in the garden, but it’s an ill wind that blows no good and I have plans now that we have a new patch of unshaded patio. Think “heated greenhouse”. As for the “Bean Trial”, it hasn’t worked out well. You may recall that we filled half a bed with compostable material and left the other half plain. I then added an “X” shaped frame and planted two Firestorm beans at the base of each cane. The half of the bed that was prepared with organic material definitely showed better germination and growth, but then nearly all the shoots disappeared. 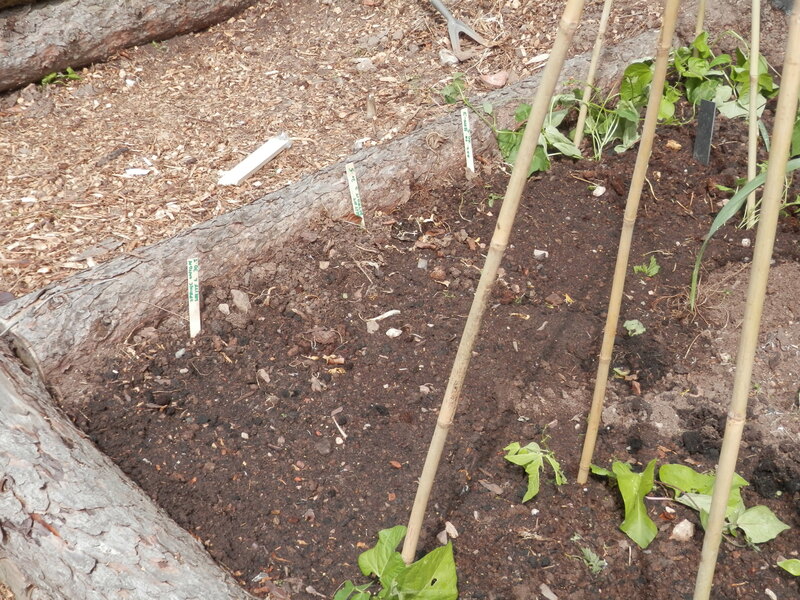 On digging holes to plant replacements I found many more beans which had germinated then been eaten. 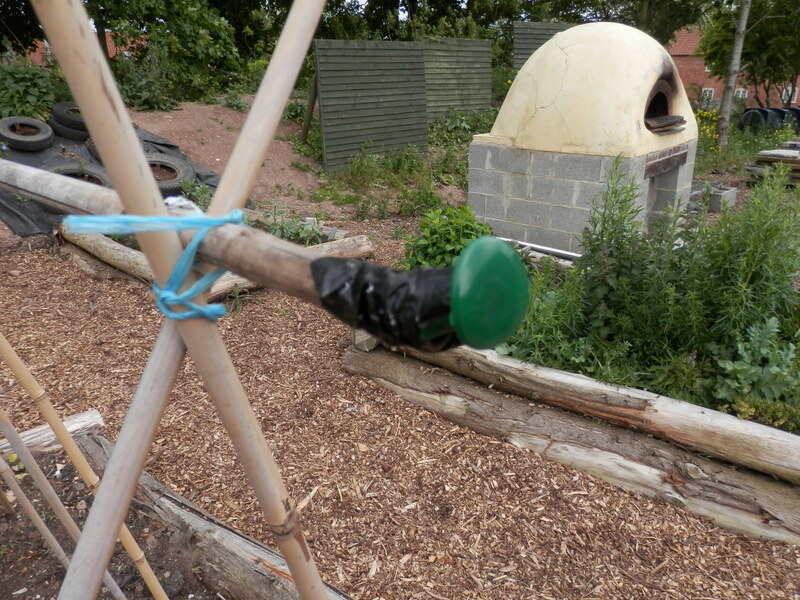 We’ve also done a Health and Safety trial with the ends of the canes. 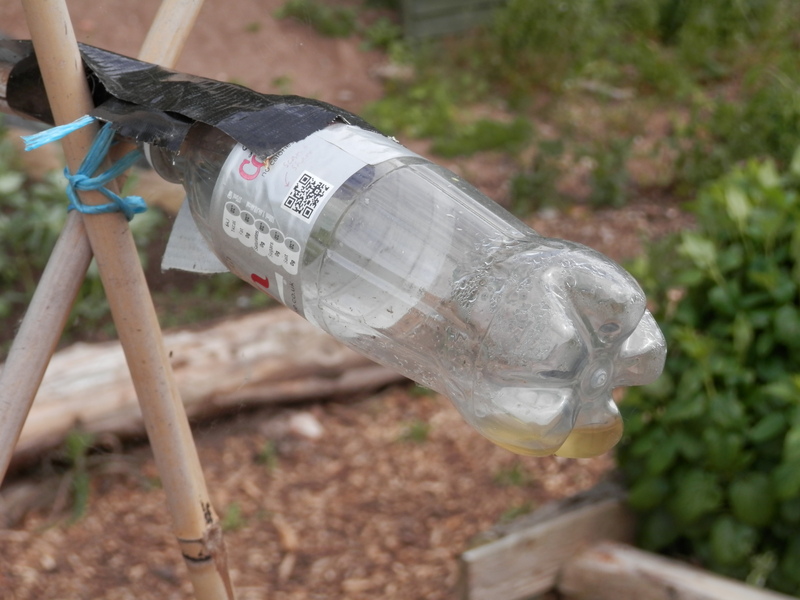 The Mark I – Coke bottle and gaffer tape is big and clumsy and tends to fall off. The Mark II – plastic protector was too small for the cane so became a Mark III using a slit and gaffer tape. The unmodified protector still works for most canes and at 12 for £1 is a good investment. Better than a poke in the eye, as they say. So, organic material is good, slugs are bad and beans that are two years past the date on the packet will still grow well. Hopefully the new plants will survive and we can start to measure the crop we get from the two sides. However, nothing is certain in life so we will just have to see. 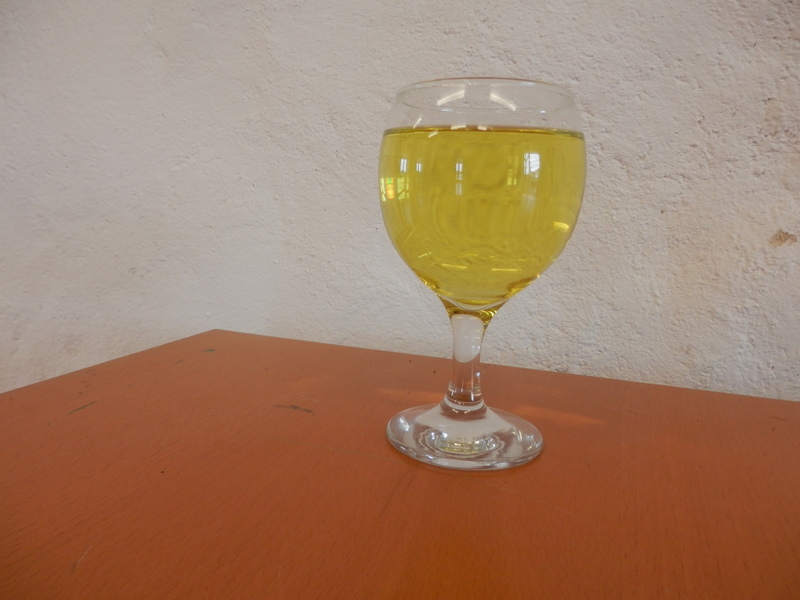 This entry was posted in Care Farm, Composting and tagged beans, compost, health and safety, laburnum, mint, mint tea, slugs on May 26, 2015 by quercuscommunity. It sometimes seems that there’s only a handful of people who actually like nettles, and I only like them because I can threaten people with nettle soup when they visit the farm. Since I started cooking with nettles they have even ruined Edward Thomas’s poem for me – I don’t want TALL nettles, I want small tender ones. My crop has been under threat for the last two weeks. Last week our Community Payback team, who are usually not industrious enough to do too much damage, were let loose with a strimmer. The nettle patch in the allotment (which I keep for butterfly food despite the folly of breeding butterflies next to brassicas) was comprehensively flattened and they also managed to trim a couple of inches off the tops of last year’s fig cuttings. I would actually like to take the time to give them some horticultural training but the sort of questions they asked last time we tried it indicate that they will only use the knowledge to get into more trouble, if you know what I mean. The second Great Destruction occurred yesterday when the farmer, in pursuit of a tidy farm for Open Farm Sunday, started cutting grass. 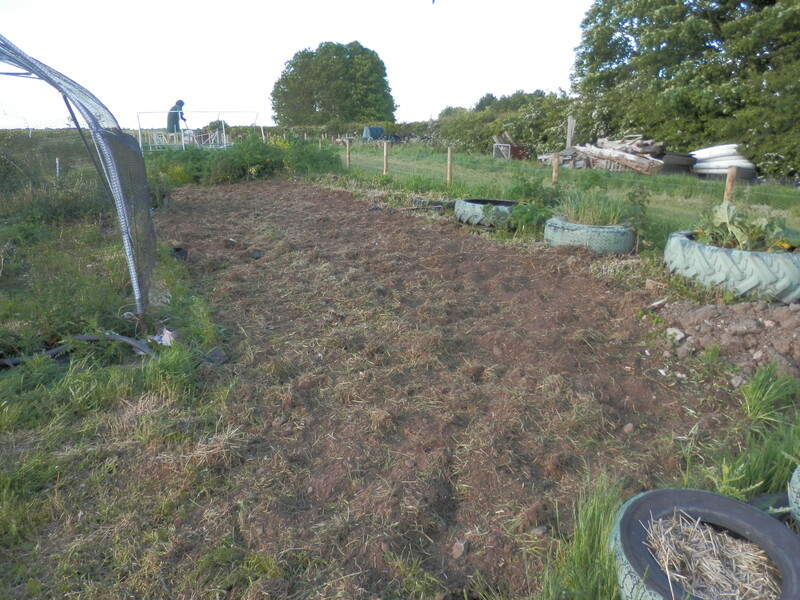 Next thing I knew there was the noise of a mower behind the polytunnels and the nettles I’d been carefully concealing from view (I thought) lay dead. I’m tempted to get lyrical about them, brought low in their prime by man and stinking machine, but what is done is done. They are in the compost heap now. “Dead, dead, and never called me mother!” as they say. I had to look that up because although I knew the phrase I didn’t know where it came from. Plan B is now in action – nettle soup on Tuesday will be made from my remaining plants – picked now and blanched in advance before any more destruction occurs, and the Open Farm Sunday soup samples will be made in advance from my nettles at home. Did I mention Open Farm Sunday – 7th June? We’ll be in the Education Tent. This entry was posted in Environment and tagged Edward Thomas, nettle soup, nettles, OPen Farm Sunday, poetry on May 24, 2015 by quercuscommunity.